The flat rate for all services is CHF 80 per hour. Efficient cooperation, and appropriate pre-sorting of the documents by customers, can reduce our expenses. As a consequence, your costs also stay low. For larger mandates, we offer graded hourly rates: CHF 80 for all qualified accounting services and CHF 55 for supporting activities. Our prices are very favorable compared to our competitors. Our hourly rates are among the lowest in Switzerland. 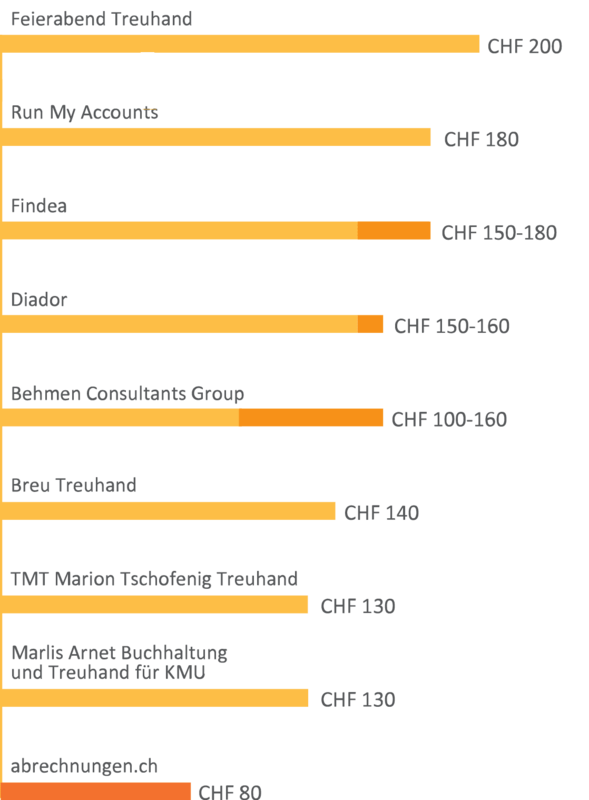 The hourly rates of Swiss trustees (as of spring 2015) serve as a basis for cross-comparison, which is represented on the following graph (if provided, the prices of completed work are used). By outsourcing accounting with us, you save not only in comparison to other trustees, but also in comparison with an internal solution. Check out our full-cost calculator to find the price of an internal working hour on a full-cost basis. The costs of an internal working hour are usually much higher than expected.